'Yaemomiji' ( Hiroshi Shimizu by Clarence Mahan, R. 1994) JI (6 F.), 35" (89 cm), Early midseason bloom. 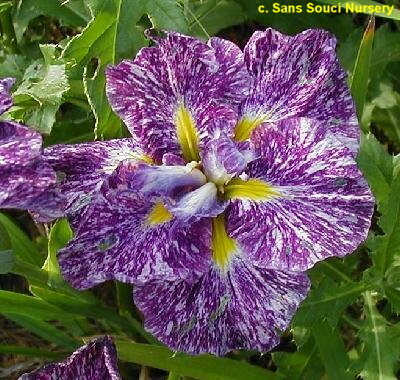 Red violet, streaked and mottled white, green signal at base turning to light yellow and extending to white; style arms white, edges and crests red violet; extra petaloids white, edged and tipped red violet. "Sakura-no-Sei" X 'Sekiyo'. Draycott 1997.